➜ Review:Bianca Frohne Cordula Nolte, Uta Halle and Sonja Kerth, eds. Dis/Ability His- tory Der Vormoderne: Premodern Dis/Ability History. Bianca Frohne Cordula Nolte, Uta Halle and Sonja Kerth, eds. 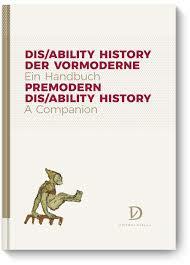 Dis/Ability His- tory Der Vormoderne: Premodern Dis/Ability History. Affalterbach: Didymos-Verlag, 2017. 512 pp. EUR 58.00 (cloth), ISBN 978-3-939020-83-7. It seems that one of the challenges of working in, and with, disability studies is recognizing that definitions and pressures affecting those who are disabled or impaired are often local and specific—one needs to attend to individual cultural and social conditions for studying how those with impairments or disabilities lived and how they are depicted in literary and historical sources, among others. At the same time, concepts and approaches can, and should, be borrowed from these more local environs for other contexts and more global articulations of the lived experiences of the impaired and disabled; indeed, our views of certain kinds of identity and disability might inform and elucidate other, seemingly unconnected expressions of disability or impairment. One of the major impediments of such borrowing is linguistic barriers and the tendency of citing, especially in the Anglo-American academic world, English-language materials. Thankfully, Premodern Dis/Ability History: A Companion is different. This collection, handbook, and guide seeks something quite ambitious: a kind of survey of the field of disability studies, with a focus on premodern subjects, topics, and areas of concentration. And the Companion’s bilingual nature will appeal to specialists of the premodern world, especially scholars working with Germanic materials or early English texts and subjects. sections on rationale and methodology—are bilingual in the purest sense. There is an opening statement, which explains how to use the book, which is printed first in German, “Wofür und für wen ist Handbuch?” and then followed by its translation in English, “How to Use This Book.” Writing about the number of specialized books and handbooks for disability studies currently available, and which focus on “the subjects, theories, methods and sources of dis/ability history,” the editors explain the need for a volume that focuses on premodern expressions of disability (p. 18). Indeed, as opposed to companions to modern disability studies, “there are few reference books which provide fundamental knowledge for the study of dis/ability in the medieval and early modern era,” even as other forms (articles, monographs, edited collections) have dealt with the history of disability and impairment (p. 18). These comments are central to the book’s aim and purpose—none of these sections is meant to be exhaustive—as this handbook offers a basis for knowledge without presenting any claim to unanimity. As the editors point out in this section, “due to the heterogeneous and fluid character of current research, controversial ideas and attitudes concerning theories, models, terminologies and spellings (dis/ability, disability) are prevailing“ (p. 19). This opening guide concludes with a note on the format of the individual entries, which appear in German and English. For the German articles, an English summary appears first, which will be of great use to readers of the book as a way to access work on disability histories in the premodern era. Inclusion of English summaries offers scholars assistance, especially if their first language is not German. This commitment to open- ness defines the volume, from its format and languages to its methodological and theoretical commitments, as the handbook voices an ongoing debate on the role and shape of premodern disability studies. Following the guide to the handbook, Uta Halle con- ceptualizes the state of the field, represented by this volume, in “A Work in Progress: The Research Programme, Premodern Dis/Ability History,” establishing some over- arching concerns and directions for the handbook as a whole, and the state of the field for premodern disability histories. She voices the effect that history of disability has had, not only on more general histories of the pre- modern era, but also on the theories, methodologies, and terms of modern disability studies. She argues that “dealing intensively with a historically and culturally unstable phenomenon such as dis/ability enables us to continuously question, or challenge, established analytical categories and concepts, and to sharpen our analytical tools” (p. 27). What follows is quite helpful: Halle outlines the various questions and concerns that a history of premodern disability offers, including the shape of terms and concepts from medieval Europe that reflect an identity based on impairment or disability, and considering whether these impairments or disabilities occasioned any kind of notice, special treatment, or importance in terms of daily social life. Besides these questions, Halle also offers a rationale for centering this study of premodern dis- ability on medieval literary texts and gives an overview of the state of German research into disability histories. The structure and concision of her rationale commends the various sections. For this reviewer, however, the discussion of the field in Germany was new information, and Halle’s guidance provides structure on how to approach the handbook. calization of identity” (p. 132). Highlighting ethics of the body based both upon care of that body and a real- ization that the dominant subject is “partial, incomplete,” dismodernism voices much of what premodern disability histories have expressed about the nuanced view of the disabled body. Later in the handbook, Bianca Frohne’s “The Body in Pain,” found in Section 8, fleshes out some considerations of how pain intersects with a number of different fac- tors, including disability and cultural contexts. She notes that, in the face of “further research from the perspective of premodern dis/ability history, it seems promising to also ask specifically how the body-in-pain was perceived of in premodern times, and how it was linked with medi- cal, emotional, sensorial, and religious concepts“ (p. 410). These histories and depictions of bodily pain, in Frohne’s view, not only reveal the ways in which pain could be expressed and felt in literary texts, but also how it ar- ticulate other characteristics and meanings of the body. Indeed, as the quotation indicates, looking at pain also means examining histories of the senses and how emo- tional responses might be shaped by pain. This article, while brief, is an example of the kind of work one can expect from the handbook. Cognizant of how premod- ern disability studies overlaps with other areas of histor- ical inquiry, this view of the body in pain nevertheless touches on a range of different genres, texts, and illus- trations, moving from medical texts to miracle accounts.
. Tanya Titchkosky, The Question of Access: Dis- ability, Space, Meaning (Toronto: University of Toronto Press, 2011), 5. Citation: Will Rogers. Review of Cordula Nolte, Bianca Frohne, Uta Halle and Sonja Kerth, eds., Dis/Ability History Der Vormoderne: Premodern Dis/Ability History. H-Disability, H-Net Reviews. November, 2018.